Although I found many news articles about the ultimatum against the Christians in Mosul issued by ISIS, I was unable to find the text available anywhere, other than in an image which circulated around Twitter. So here I have transcribed and translated the decree. Because I have done this quickly, I have no doubt that I have made some errors of transcription or translation; any suggestions welcome! 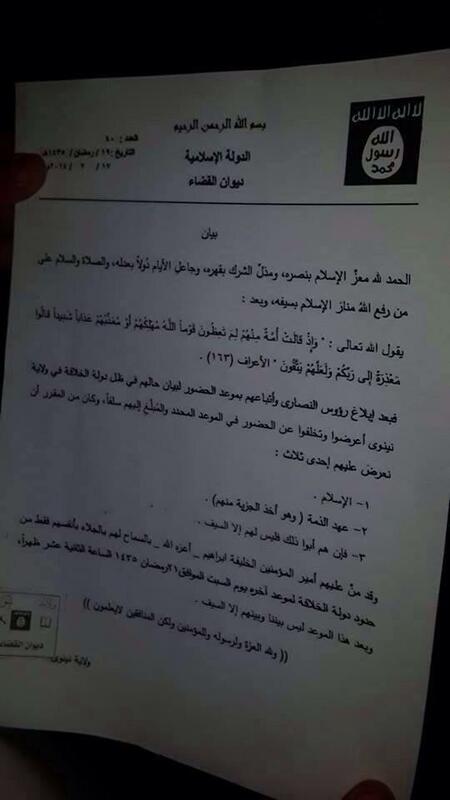 The ultimatum decree issued by ISIS ordering Christians to convert, to pay jizya, or to die. Date: 19/ Ramadan / 1435 A.H.
17 / 7 / 2014 A.D.
2. The contract of dhimma (and it includes taking the jizya from them). 3. And if they refuse these, there is nothing for them but the sword. And the Commander of the Faithful, Caliph Ibrahim (may God strengthen him) has granted to them permission for them to depart with only their persons from the boundaries of the state of the caliphate at the latest by Saturday which falls on 21 Ramadan 1435, at the hour of twelve noon, and after this time there is nothing between us and them but the sword. This entry was posted in Iraq, Middle Eastern Christianity, Terrorism and tagged Abu Bakr al-Baghdadi, bismillah, Christians, dhimmis, document, expulsion, Iraq, Islamic State of Iraq, jihadis, jizya, Mosul, Nineveh Province, persecution, qadis, Qur'an, shahada, Sura al-A'raf, Sura al-Munafiqun, translation on July 23, 2014 by Thomas A. Carlson.